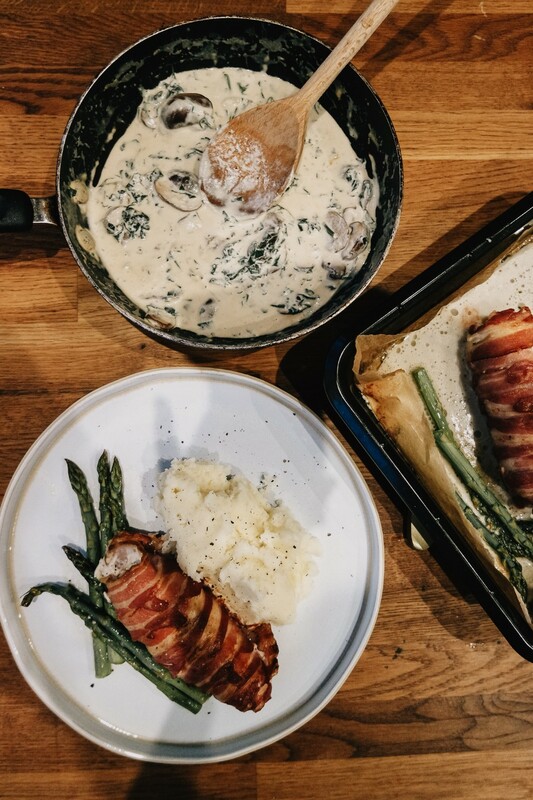 I'm posting this one for Valentines day as it's the kind of aiming-to-impress meal that is actually possible and actually insanely tasty. Plus wine. 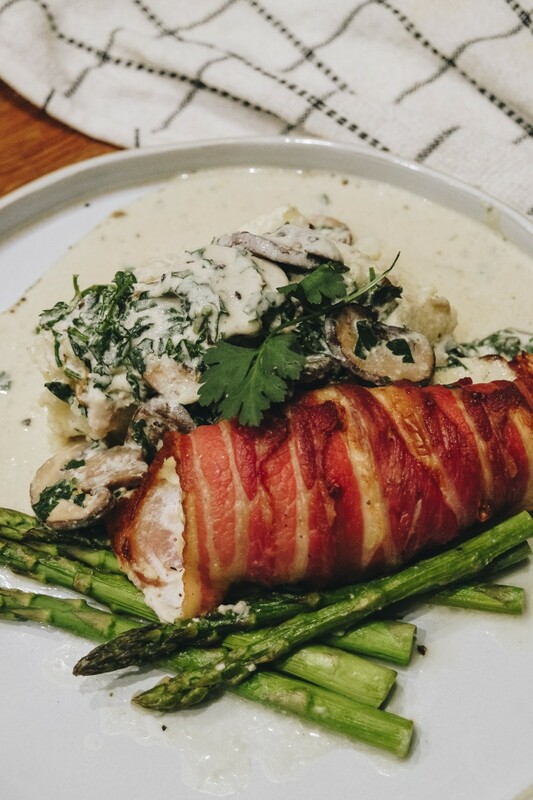 Stuffed chicken breasts are ALWAYS going to be a hit. 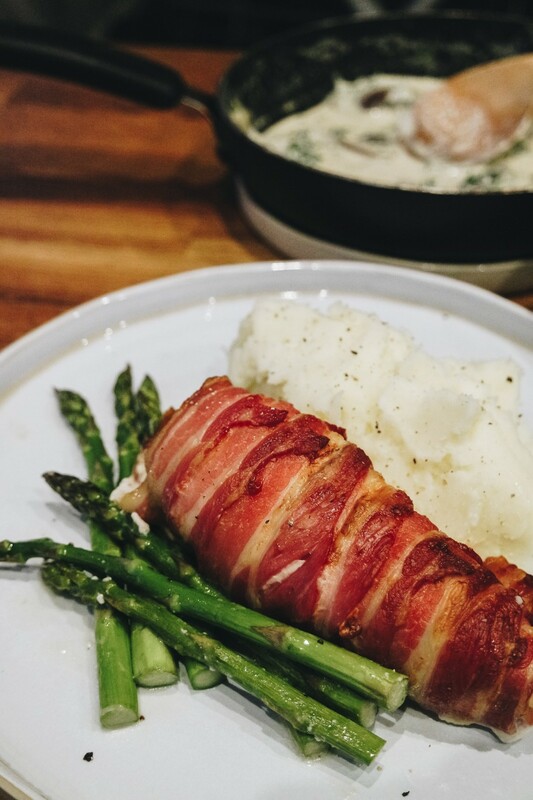 I think the classic is wrapped in parma ham, which is fine and nice, but bacon always works and you get more for your buck. Also, PSA, this is a garlic lover dish. 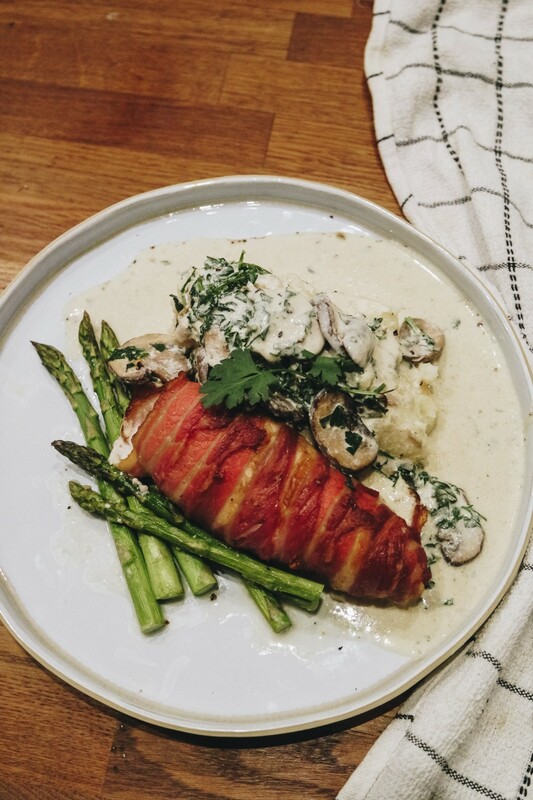 Some would say Boursin stuffed chicken AND a mushroom/garlic/cream sauce is too far. I would not. It is what it is. It's the flavour palette I chose. You will both smell of garlic. It's fine. Show me if you make it! Don't forget the veg! I used asparagus, because that's the fancy green one, but broccoli could be cooked the same way, or green beans in a separate saucepan. Boursin is my favourite taste wise, but apparently philadelphia cheese keeps the chicken more moist. Personally that didn't really matter to me as I was cooking a sauce on the side, but you do you! BACON IS ALWAYS SMOKED IN MY HOUSE. First, peel and chop your potatoes and leave to the side in a saucepan for later. 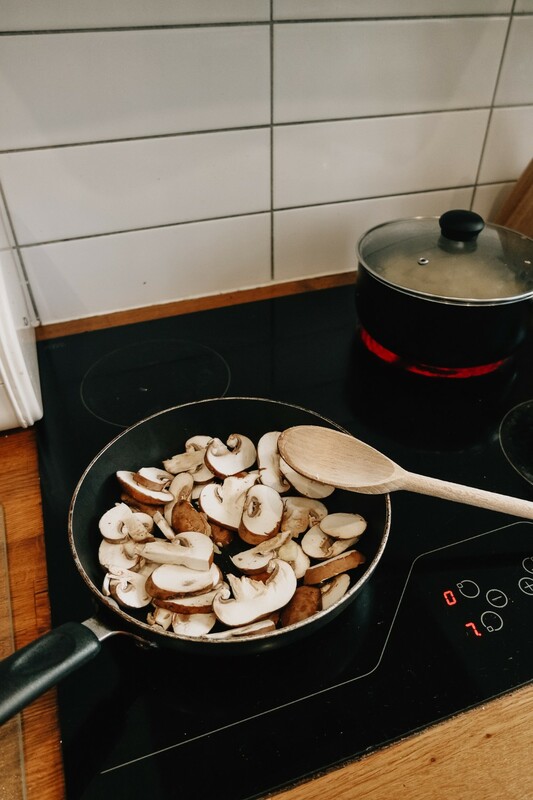 Slice the mushrooms and leave in a separate frying pan. This is so you don't risk mixing them with raw chicken later on. Butterfly the chicken breasts by slicing them carefully in half down the side. Leave one side connected like below, but cut so that the two halves lay flat. 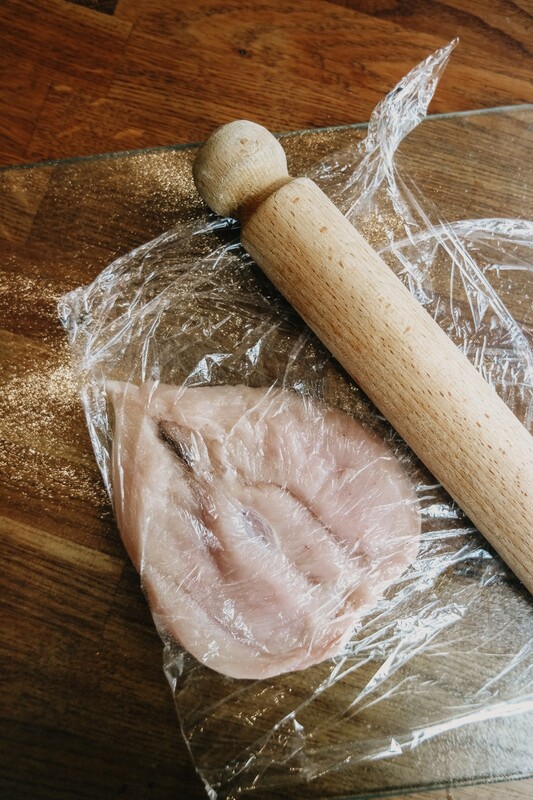 Cover the chopping board with clingfilm (or baking parchment - more eco), fold it over the butterflied chicken and flatten slightly with a rolling pin. Don't pummel it too hard though or it can split. This is so that it's easier to stuff & wrap with more ingredients - like chorizo, asparagus, spinach... you can do a lot! 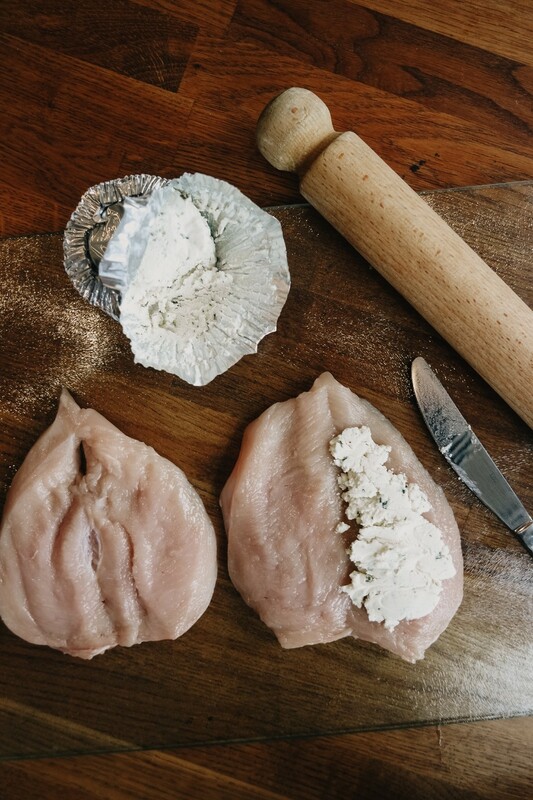 Spread the cream cheese onto one half of each chicken breast. Be careful not to touch the chicken with the knife and then go back into the cream cheese! It's best to scoop out a lump for each and then spread. 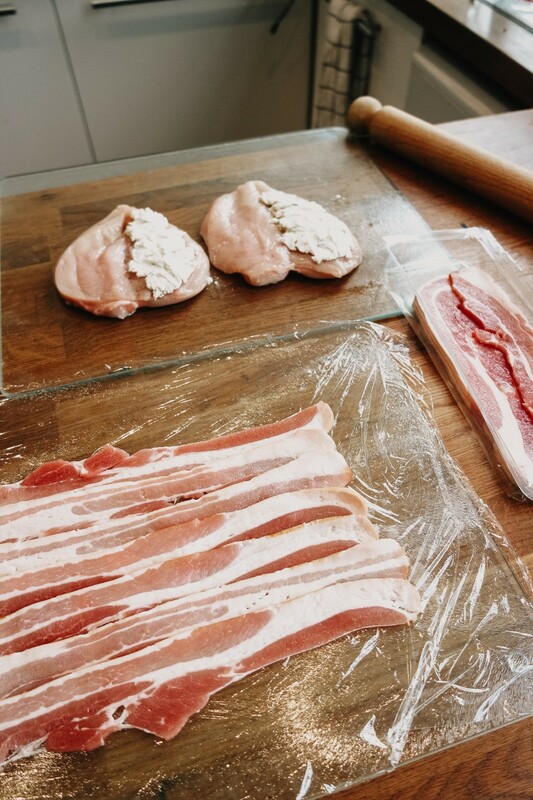 Lay out another piece of clingfilm and layer it with streaky bacon. Overlap them slightly so there are no gaps. It should be as long as each of the chicken breasts, and as wide as the rashers. 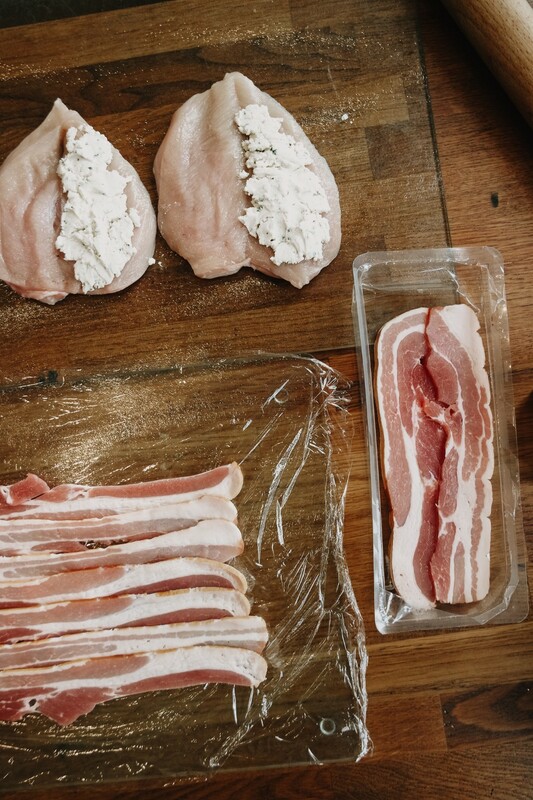 Fold the chicken back up and place on top of the bacon, at the centre. 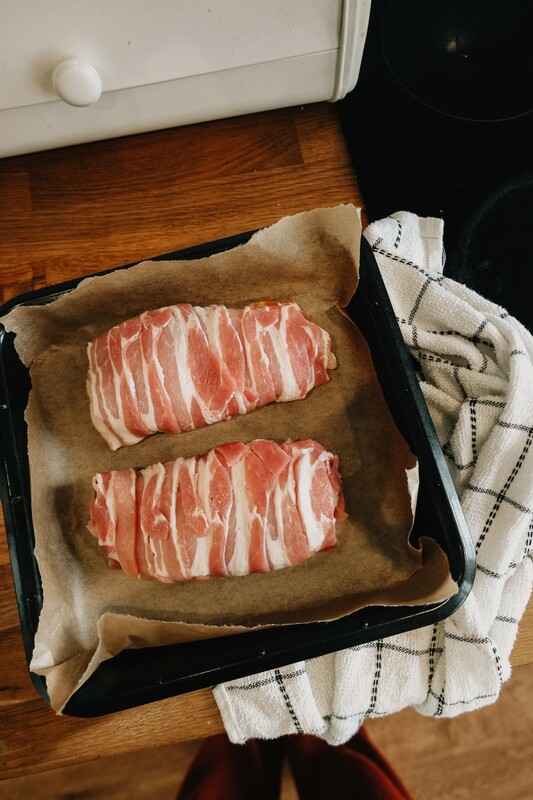 Peel up the two ends of the cling film on the left and pull the bacon over the chicken. Peel off the clingfilm (the bacon should stick down) and do the same with the right hand side. Roll it up neatly and tuck in the ends. This can be saved in the fridge for later if need be! Unwrap the chicken carefully and place onto a baking tray. I used baking parchment so it wouldn't stick to the bottom. Pop in the oven for 25-30 minutes before checking. For the final 5-10 minutes of cooking, put the asparagus in around the chicken. This will be 30-40 minutes in total. As soon as they're in the oven, cover the potatoes with cold water and bring to a boil until soft. The speed really depends on how small the chunks are, so keep checking until they can be smushed with a fork! 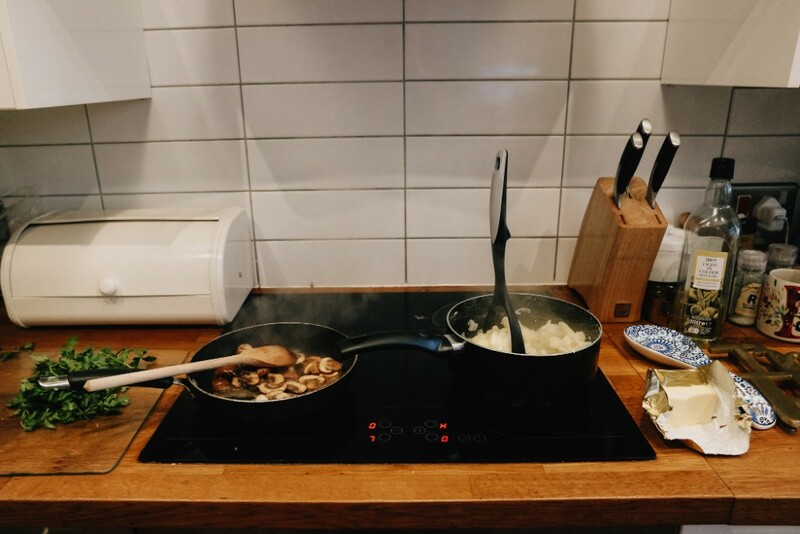 While the potatoes are boiling, slowly fry the mushrooms in some butter & oil with crushed garlic. Be careful not to let them burn. 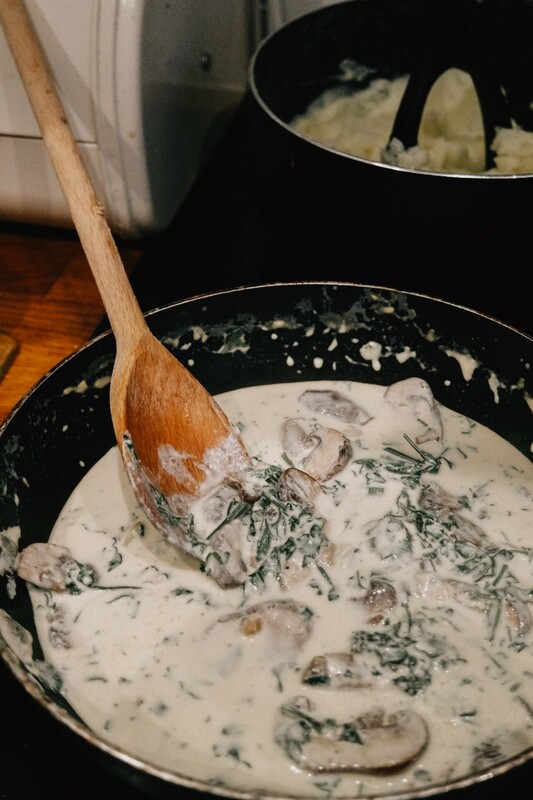 Once they look cooked, pour in the white wine and let half of it evaporate before adding in the cream and chopped parsley. Keep it at a low heat, stir, and thin with milk if necessary. Add lots of black pepper and salt to taste. 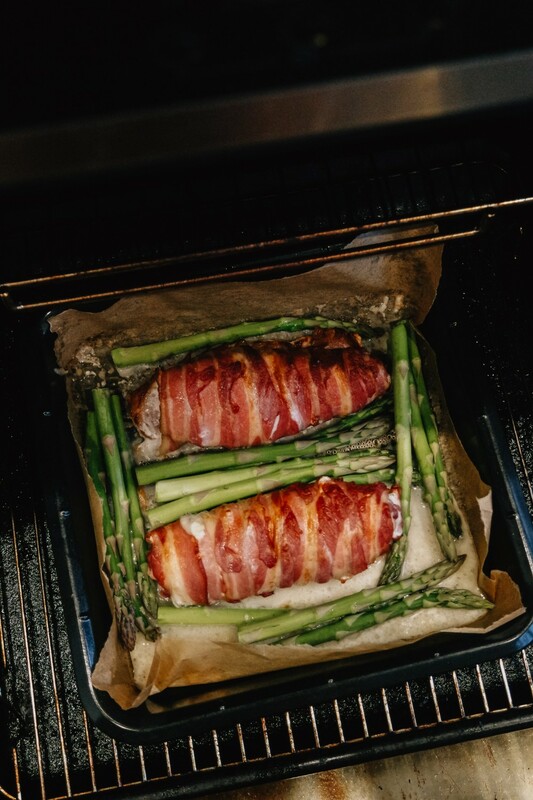 Remember to check on the chicken after 25-30 minutes and put the asparagus in with it for the final 5-10 minutes. by sticking a knife into the centre of one breast and checking to see if the metal comes out hot. If the cream cheese has melted out and the bacon has browned slightly, it's probably ready to come out. Leave it to sit until everything else is ready. Once the potato is ready, drain the saucepan. Add a knob of butter, some milk and salt & pepper and mash until smooth. If you're worried about the chicken, cut it up into 25mm slices just to make sure the centre is cooked and it can be served like that! 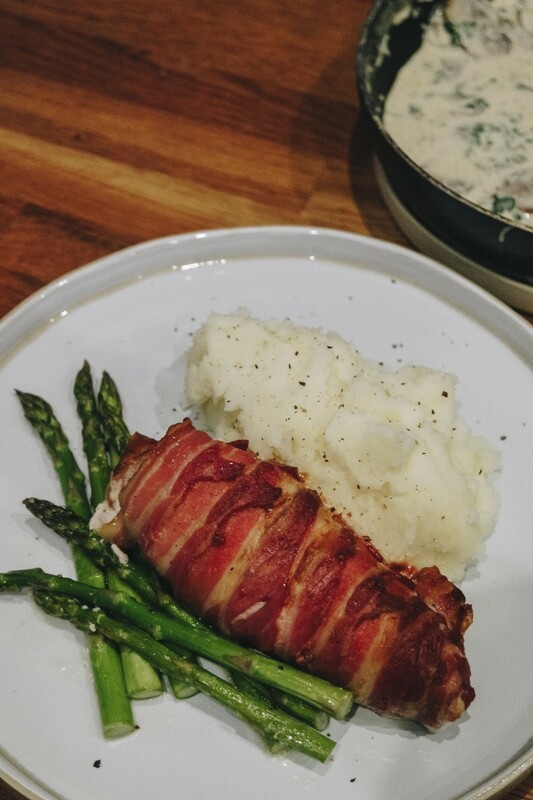 The first few times I cooked stuffed chicken I was worried about the centre, but I've never actually undercooked it. 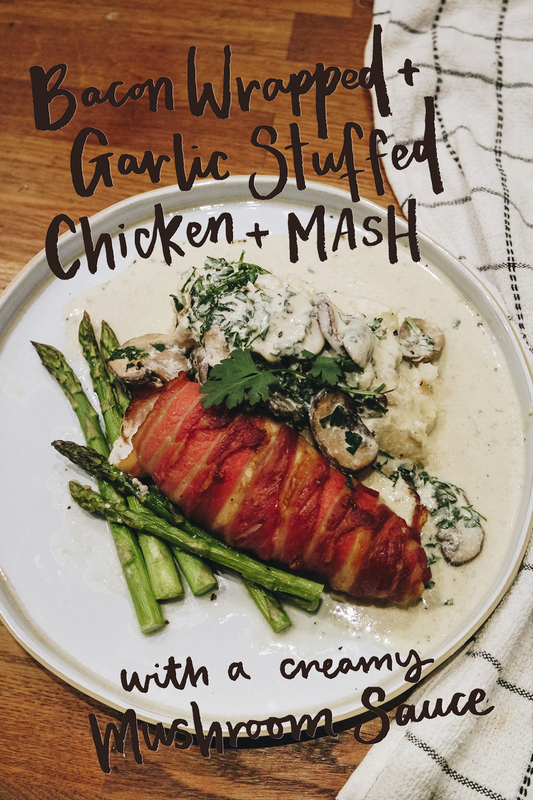 Scoop the portions of mash out onto the plates, then the asparagus, then put the chicken on top. 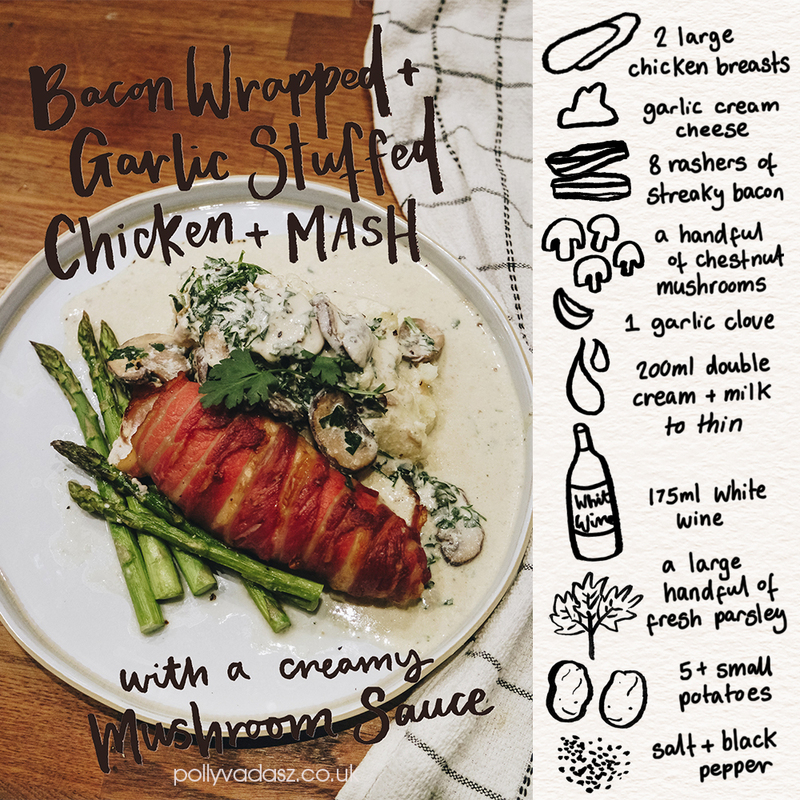 Pour the remaining chicken & cream cheese juices into the mushroom sauce for added flavour, and then pour that all over the mashed potato. Add a little piece of fresh parsley on top for the fancy factor. This is the first of (maybe) a thing I do on Instagram !! 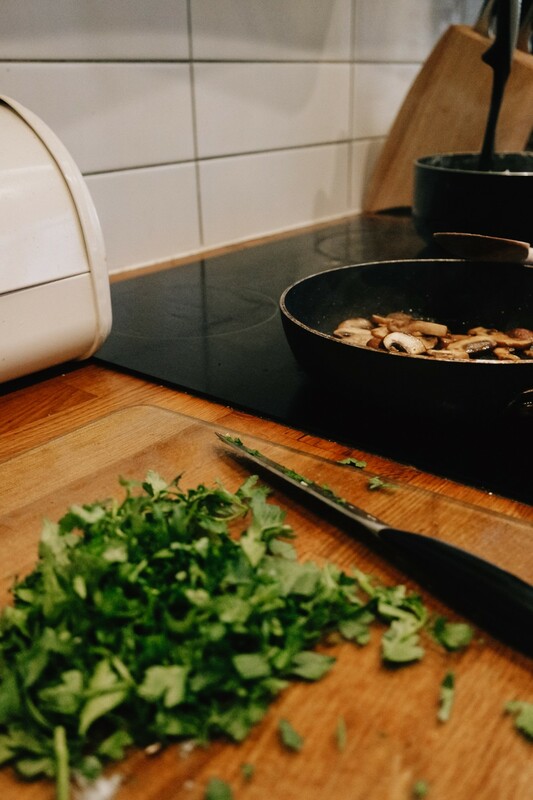 I'm thinking I'll film myself cooking a meal idea, then post the recipe alongside the next day and save the story as a highlight for the next week or two. 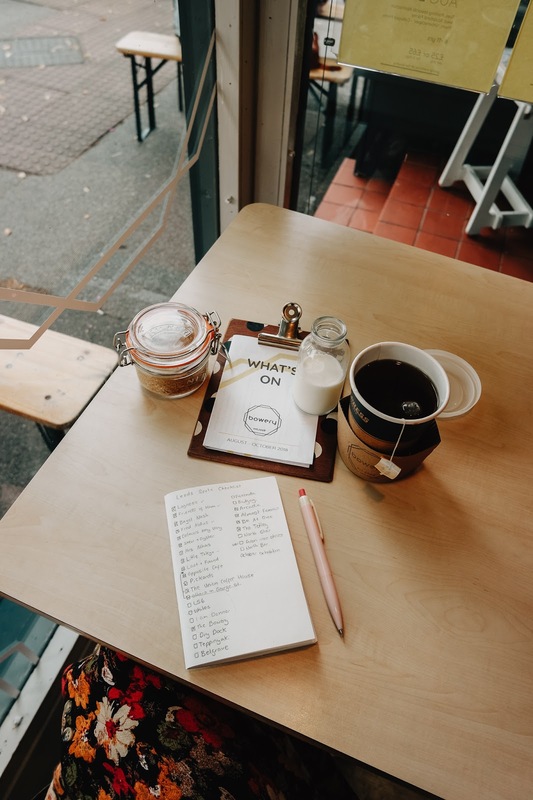 I think it would be fun to create a little incentive to try one new or "inspired" meal a fortnight - and it gives you loads of time & instruction to help! Then once the highlight is gone, you'll have made it before so just have to look up the recipe on the blog!